During Walt Disney Parks and Resorts Chairman Jay Rasulo’s presentation on the future of Disney Park’s and resorts at the Disney D23 Expo in Anaheim, he confirmed what has been speculated for some time now: a new 3-D version of the tremendously-popular “Star Tours” attraction will debut at the Disneyland Resort and Disney’s Hollywood Studios in 2011. He began the announcement with, “I have some bad news… Star Tours will be closed…” at which time a large contingent of Stormtroopers and Darth Vader himself flooded the stage, the dark lord himself letting Jay know that the news greatly displeased him. Of course that was only to add some entertainment and suspense to the announcement because Jay quickly made it clear that he had not finished what he was saying as the attraction was closing only to make way for a updated version, this one in 3-D. 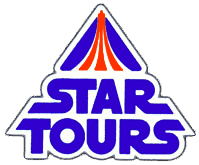 While Star Tours was very innovative and advanced when it originally debuted in 1987, many have felt for some time now that it was long overdue for an update. That will now take place and in Jay’s own words, they will do something with this attraction that no one has ever done before. For a sampling of what guests might experience, those of us in attendance of his presentation were asked to put on the 3-D glasses that were given to us upon entering the Anaheim Convention Center’s Arena and were then treated to the following video presentation. Of course the video above is not in 3-D and therefore not quite as impressive as what we experienced in the arena itself. Nevertheless, I am thrilled to see that Disney will now update this 22 year old attraction, not only bringing it up to date with all the current technology in simulation rides but adding three dimension technology as well. If you have yet to experience this thrilling attraction, Star Tours is a simulator ride located in several Disney theme parks, including Disneyland in California, Disney’s Hollywood Studios in Florida, Tokyo Disneyland in Japan, and Disneyland Park in Paris. The ride is based on the successful Star Wars franchise of movies, created by George Lucas, making it the first of the park’s attractions that did not use Disney-designed imagery. The first incarnation of the ride appeared in Tomorrowland at Disneyland in 1987, replacing the previous attraction, Adventure Thru Inner Space.